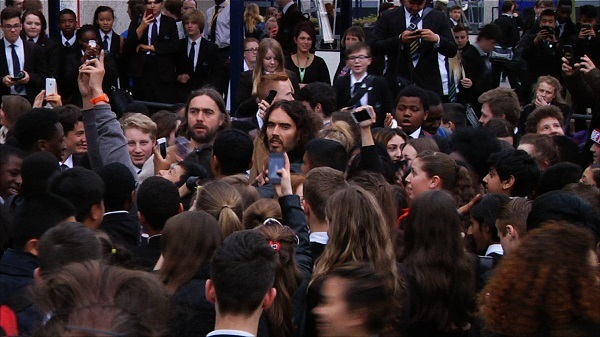 His film Brand: A Second Coming may have had its European Premiere in London at the London Film Festival, but that wasn’t enough to ensure that local lad Russell Brand joined cast and colleagues on the red carpet. If any of them had turned up, that is. Fresh from the shocking discovering that he called upon the cast to boycott the premiere, this is the full interview from the story first reported in the Sunday Mirror, as his furious collaborator and director on the project, acclaimed filmmaker Ondi Timoner, hit back with some colourful home truths as a consequence of her access all-areas pass and prolonged spell with the controversial comedian-turned-political activist. “I always knew he had control issues, which is why I demanded creative control”, she went on to say. “I’m the sixth director and he admitted that the reason the film was flawed and impossible to make, and why I had to shoot a whole new movie, was because he had blown through a lot of investment: millions of dollars flying crews around and keeping them in the hotel room except for rolling camera on a little sit down interview that he had with somebody or a photo shoot. “He never let anyone capture the real Russell, and I said if you want me to make this film, I need to make it about you and I’m going to get creative control. Without it, we wouldn’t be sitting here. “I don’t know how it feels to have a film made about me, so I have sympathy and compassion for that, and empathy that it has a lot of very private and personal moments in it that he wanted me to take out in some form. “But I did take out a lot for him. I did do extra stuff for him. I bent over backwards for him. Bent over backwards. Way past when it was money (involved). I’ve gone way over the mile. No subject has ever asked me to change a thing in my films and he demanded, threatened all this stuff. “I did everything I could for him and then I had to draw the line and exercise my creative control in order to save the film, and him from having a terrible film. She added: “I said you’re going to get a puff-piece if I make all these changes, and he said, ‘well, that’s the second worst thing that can happen’. It’s one thing not to show up… well, it’s not good. It doesn’t look good. The movie’s coming out. You can’t avoid it. But when people see it, they’ll see that, actually, it’s great for him. Defending Brand against his biggest detractors and the most common cry – that of ‘hypocrisy’ – she had this to say: “I think that people use the word hypocrisy to write somebody off. The fact is that we keep people in boxes in our society and it doesn’t do anybody any good. Because he’s a comedian, he shouldn’t talk about drugs; because he’s a comedian, he shouldn’t write a book about revolution. “I’m all for him with all that stuff, but I think this is where his self-destructive hypocrisy rears its head in a way that is really selfish and not okay. He acts like he’s a very authentic person and he’s capable of that and he wants us to all be who we are. This film tells us to be who we are, and not only does he not face who he is, but he also wants to be the puppet-master. If he’s not controlling the story, the story shouldn’t be told. “It feels like I’m dealing with a 5 year old or something. I just can’t believe it. It’s disappointing because he’s my subject, I believed in him and I did everything I could for him. In a lot of ways he can’t see past himself. He truly is a narcissist. Truly is a narcissist. He can’t see outside of himself enough to appreciate what’s been done for him”, said the director. The film is notable not only for touching upon Brand’s transition from serial shagger to conscientious agitprop for a new political system, but also his personal life too. This includes a rare and frank insight into his marriage to pop star Katy Perry, in both archive and fresh interview footage. 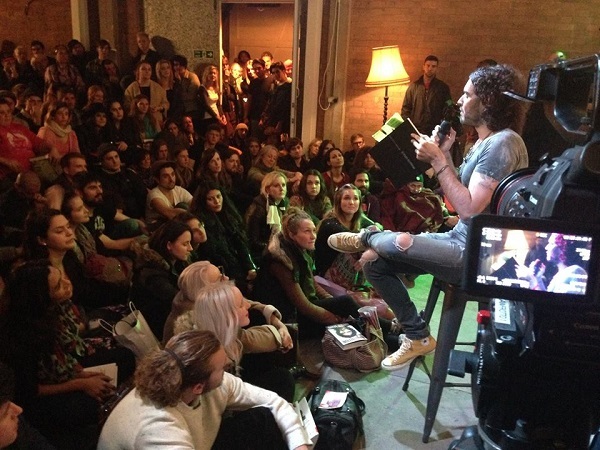 Russell Brand is another notch on a director’s filmography that has involved a number of dysfunctional and mercurial characters. Ondi explained Brand’s appeal amongst this band of ‘impossible visionaries’, as she calls them. “We need to go and solve problems that are bigger than trying to get followers on Instagram or trying to hits of dopamine by getting likes on your latest post, which is what most people are after: their 15 minutes of fame. “I feel that Brand: A Second Coming tells the story of the rise and fall of 15 minutes of fame; about a man who went after everything that we think will make us happy. He could buy anything he wanted, he had every girl, he became a Hollywood star, he married the biggest pop star in the world and he came up empty. “He started to look within and look at people who put their lives on the line for something way bigger than themselves: Malcolm X, Che Guevara. He challenged himself through the comedy to figure out, walk in their shoes and see whether he could do that. Then went he out and wrote a book about revolution, so who knows what’s going to happen next. “I think he’s a really loveable guy in a lot of ways, but he’s also, as he says in the scene with his father: ruthless. Ruthless. When he gets his head turned around on something, he doesn’t listen to anybody else. “He said to me, ‘insanity is listening to the voices in your head over voices outside of it’. I almost put it in the movie. He said, ‘I like that’. So, everyone, all of his trusted advisors, everyone that cares about him and that he loves, has gone, ‘Russell, this is a great film’. Everyone. “His agent contacted me himself and said, ‘this is a fantastic film. You’re an incredible filmmaker. This is brilliant’. They’ve told him that. Even if he can’t see it, he can’t even trust those people. Even if he can’t trust those people, he still has to lash out at me. It’s like, what are you doing?! 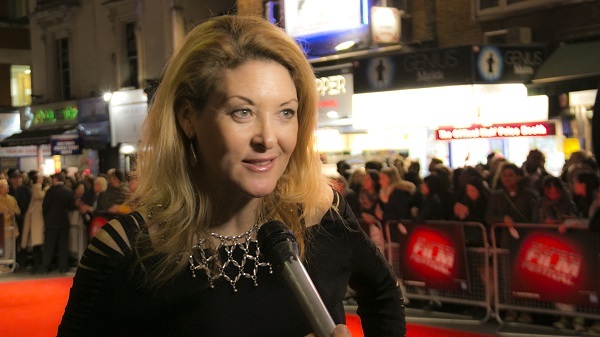 As much as her anger towards the boy from Grays was palpable, it was plain that Ondi Timoner still has affection for Brand in spite of his problems. Signing off, she had one final observation and piece of advice. “My wish for him is that he would become comfortable with letting go”, she said, before wistfully adding, “I think that’s what he’s been trying to do his whole life. And that’s what he needs to keep working on”. Brand: A Second Coming is in cinemas from 23rd October 2015.